ABOUT 100 Nelson Mandela Metropolitan University students in the field of business and economic sciences as well as unemployed commerce graduates will benefit from a joint venture by the university and the Madiba Bay Accountancy Training (MBAT) to ensure their workplace readiness. The group will even be given driver training at the Coega Development Corporation and have the opportunity to make appointments for their learners’ licences. The 2013 FASSET Workplace Readiness Bridging Programme, which started on 18 June at NMMU’s South Campus, is aimed at black commerce students who are currently completing their studies or who graduated in 2012 and 2013 but are unemployed. BCom graduates and those completing their postgraduate diplomas in Accounting or Internal Auditing at NMMU could also apply. The programme runs until 23 July. Thereafter, graduates are placed with employers in the FASSET sector to gain workplace experience for a period of three months before starting their internship programmes from late November 2013 or from January 2014. FASSET is the Sector Education and Training Authority (Seta) for Finance, Accounting Services. Management Consulting and other Financial Services. 21 Setas have been established in terms of the Skills Development Act, to cover all sectors in South Africa, including government. “Many graduates have difficulty in finding employment after completing their studies. Although they typically have the academic and technical skills, they often lack some basic skills, referred to as work readiness or job readiness skills, also referred to as graduate employability,” says MBAT’s Dr Annemarie Barnard. National and international research shows that the real problem is not the lack in appropriately qualified graduates, it is employable graduates that the market desperately needs. Modules being covered include business ethics, problem solving and decision, written communication skills, oral communication techniques and skills, personal goal setting, project planning, teamwork and managing personal finance. “This programme will equip learners with critical workplace skills and workplace experience and thus improve their chances of finding full-time employment immensely,” says Dr Barnard. The proposed project is aligned to the key developmental and transformation imperatives outlined in the National Skills Development Strategy III. It also promotes a partnership between a public and a private provider. The programme will end off with a ceremony on Friday, 26 July 2013. 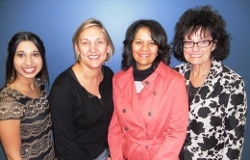 IMAGE: The coordinators of the FASSET programme are from left Taahira Tiry and Dr Annemarie Barnard of MBAT and NMMU’s Ronel Rizzo and Elize Naude.